I will update this page periodically, am also trying to give it a simplified coverage whilst maintaining some In Depth coverage, for the different styles of my readers.. Coming soon a page devoted to each planet, and other features of the Solar System. Our solar system consists of the sun, eight planets, moons, many dwarf planets or plutoids: the discovery of Eris in 2005, and similar in size to Pluto caused scientists to reconsider the definition of a planet, an asteroid belt, comets, meteors, and others. The sun is the center of our solar system; the planets, their moons, a belt of asteroids, comets, and other rocks and gas orbit the sun. Easy ways to remember the order of the planets (plus Pluto) are mnemonics: “My Very Easy Method Just Simplifies Us Naming Planets” The first letter of each of these words represents a planet – in the correct order. From our small world we have gazed upon the cosmic ocean for thousands of years. Ancient astronomers observed points of light that appeared to move among the stars. They called these objects planets, meaning wanderers, and named them after Roman deities — Jupiter, king of the gods; Mars, the god of war; Mercury, messenger of the gods; Venus, the goddess of love and beauty; and Saturn, father of Jupiter and god of agriculture. The stargazers also observed comets with sparkling tails, and meteors — or shooting stars apparently falling from the sky. Since the invention of the telescope, three more planets have been discovered in our solar system: Uranus (1781), Neptune (1846) and Pluto (1930). Pluto was reclassified as a dwarf planet in 2006. In addition, our solar system is populated by thousands of small bodies such as asteroids and comets. Most of the asteroids orbit in a region between the orbits of Mars and Jupiter, while the home of comets lies far beyond the orbit of the dwarf planet Pluto, in the Oort Cloud. The four planets closest to the sun — Mercury, Venus, Earth, and Mars — are called the terrestrial planets because they have solid rocky surfaces. The four large planets beyond the orbit of Mars — Jupiter, Saturn, Uranus, and Neptune — are called the gas giants. Beyond Neptune, on the edge of the Kuiper Belt, tiny, distant, dwarf planet Pluto has a solid but icier surface than the terrestrial planets. Nearly every planet — and some moons — has an atmosphere. Earth’s atmosphere is primarily nitrogen and oxygen. Venus has a thick atmosphere of carbon dioxide, with traces of poisonous gases such as sulfur dioxide. Mars’ carbon dioxide atmosphere is extremely thin. Jupiter, Saturn, Uranus, and Neptune are primarily hydrogen and helium. When Pluto is near the sun, it has a thin atmosphere, but when Pluto travels to the outer regions of its orbit, the atmosphere freezes and collapses to the planet’s surface. In that way, Pluto acts like a comet. There are 146 known natural satellites (also called moons) in orbit around the planets in our solar system, ranging from bodies larger than our own Moon to small pieces of debris. 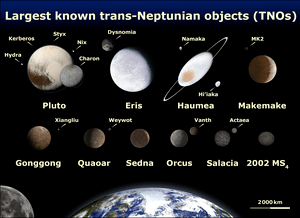 Many of these were discovered by planetary spacecraft. Currently, another 25 moons are awaiting final approval before being added to our solar system’s moon count. Some moons have atmospheres (Saturn’s Titan); some even have magnetic fields (Jupiter’s Ganymede). Jupiter’s moon Io is the most volcanically active body in the solar system. An ocean may lie beneath the frozen crust of Jupiter’s moon Europa, while images of Jupiter’s moon Ganymede show historical motion of icy crustal plates. Some moons may actually be asteroids that were captured by a planet’s gravity. The captured asteroids presently counted as moons may include Mars’ Phobos and Deimos, several satellites of Jupiter, Saturn’s Phoebe, many of Uranus’ new satellites, and possibly Neptune’s Nereid. This new class of worlds helps us categorize objects that orbit the Sun but aren’t quite the same as the rocky planets and gas giants in our solar system. There could be hundreds more of these small worlds far out there waiting to be discovered. What is a planet? We’ve been asking that question at least since Greek astronomers came up with the word to describe the bright points of light that seemed to wander among fixed stars. Our solar system’s planet count has soared as high as 15 before it was decided that some discoveries were different and should be called asteroids. Many disagreed in 1930 when Pluto was added as our solar system’s ninth planet. The debate flared again in 2005 when Eris— about the same size as Pluto — was found deep in a zone beyond Neptune called the Kuiper Belt. Was it the 10th planet? Or are Eris and Pluto examples of an intriguing, new kind of world? The International Astronomical Union decided in 2006 that a new system of classification was needed to describe these new worlds, which are more developed than asteroids, but different than the known planets. Pluto, Eris and the asteroid Ceres became the first dwarf planets. Unlike planets, dwarf planets lack the gravitational muscle to sweep up or scatter objects near their orbits. They end up orbiting the sun in zones of similar objects such as the asteroid and Kuiper belts. This count includes only the moons orbiting the eight planets in our solar system. It is likely there are more moons orbiting the giant planets of our solar system and there are moons orbiting around dwarf planets and asteroids. 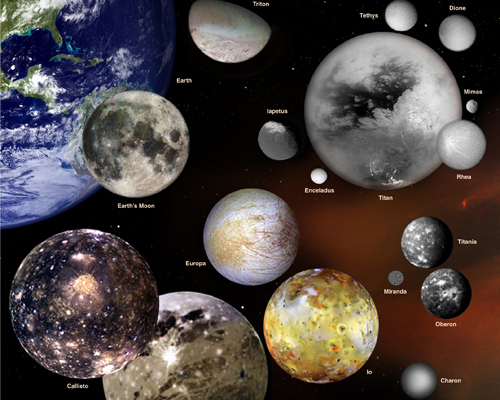 Moons — also called satellites — come in many shapes, sizes and types. They are generally solid bodies, and few have atmospheres. Most of the planetary moons probably formed from the discs of gas and dust circulating around planets in the early solar system. Astronomers have found at least 146 moons orbiting planets in our solar system. This number does not include the six moons of the dwarf planets, nor does this tally include the tiny satellites that orbit some asteroids and other celestial objects. Another 25 moons are awaiting official confirmation of their discovery. Of the terrestrial (rocky) planets of the inner solar system, neither Mercury nor Venushave any moons at all, Earth has one and Mars has its two small moons. 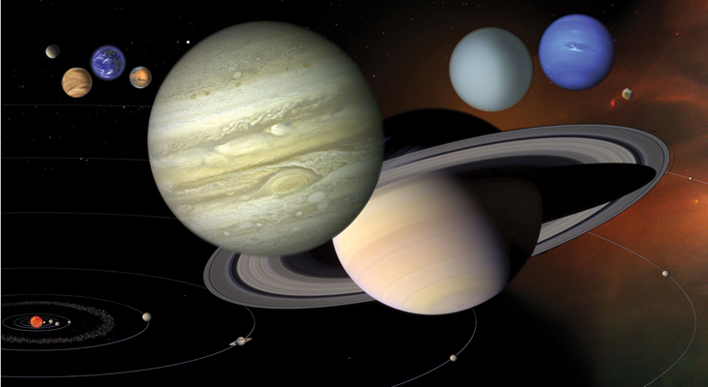 In the outer solar system, the gas giants Jupiter and Saturn and the ice giants Uranus and Neptunehave numerous moons. As these planets grew in the early solar system, they were able to capture objects with their large gravitational fields. Earth’s Moon probably formed when a large body about the size of Mars collided with Earth, ejecting a lot of material from our planet into orbit. Debris from the early Earth and the impacting body accumulated to form the Moon approximately 4.5 billion years ago (the age of the oldest collected lunar rocks). Twelve American astronauts landed on the Moon during NASA’s Apollo program from 1969 to 1972, studying the Moon and bringing back rock samples. New asteroids are discovered on an almost daily basis. It is estimated that the mineral wealth of the asteroids in the main belt between Mars and Jupiter is about $100,000,000 for every person on Earth. Asteroids are rocky, airless worlds that orbit our sun, but are too small to be called planets. Tens of thousands of these “minor planets” are gathered in the main asteroid belt, a vast doughnut-shaped ring between the orbits of Mars and Jupiter. Asteroids that pass close to Earth are called Near-Earth Objects (NEOs). NASA’s Dawn mission is on a 3-billion-km (1.7-billion-mile) journey to the asteroid belt to orbit asteroid Vesta and dwarf planet Ceres. Scientists hope to characterize the conditions of the solar system’s earliest days by studying these two very different worlds. Discovered in 1801, Ceres was the first asteroid discovered. It has since been reclassified as a dwarf planet because it is more like a planet that its neighbors in the main asteroid belt. Asteroids that populate the main asteroid belt between Mars and Jupiter, and pose no threat to Earth, can be as big as 940 km (about 583 miles) across. Asteroids, sometimes called minor planets, are small, rocky fragments left over from the formation of our solar system about 4.6 billion years ago. Most of this ancient space rubble can be found orbiting the sun between Mars and Jupiter. Asteroids range in size from Ceres, about 952 km (592 miles) in diameter, to bodies that are less than 1 km (0.6 mile) across. The total mass of all the asteroids is less than that of Earth’s Moon. Even with more than one-half million asteroids known (and there are probably many more), they are still much more widely separated than sometimes seen in Hollywood movies: on average, their separation is in excess of 1-3 million km (depending on how one calculates it). Orbiting spacecraft such as SOHO have raised this tally in recent years by catching the comets as they plunge toward the Sun – and sometimes vaporize. Scientists estimate there could be as many as 1,000,000,000 comets held in the gravitational grip of the Sun. 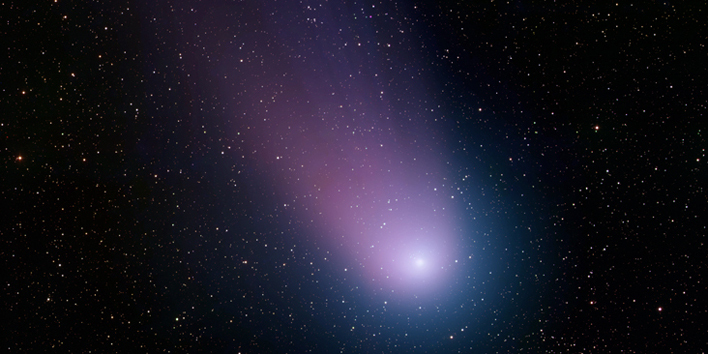 Comets are cosmic snowballs of frozen gases, rock and dust roughly the size of a small town. When a comet’s orbit brings it close to the sun, it heats up and spews dust and gases into a giant glowing head larger than most planets. The dust and gases form a tail that stretches away from the sun for millions of kilometers. In the distant past, people were both awed and alarmed by comets, perceiving them as “long-haired” stars that appeared unpredictably and unannounced in the sky. To some ancient observers, an elongated comet looked like a fiery sword blazing across the night sky. Chinese astronomers kept extensive records for centuries, including illustrations of characteristic types of comet tails. They recorded the times of cometary appearances and disappearances in addition to celestial positions. These historic comet annals have proven to be a valuable resource for later astronomers. We now know that comets are leftovers from the dawn of the solar system around 4.6 billion years ago, and consist mostly of ice coated with dark organic material. They have been referred to as dirty snowballs. They may yield important clues about the formation of our solar system. Comets may have brought water and organic compounds, the building blocks of life, to the early Earth and other parts of the solar system. Each comet has a tiny frozen part, called a nucleus, often no bigger than a few kilometers across. The nucleus contains icy chunks and frozen gases with bits of embedded rock and dust. The nucleus may have a small rocky core. Europe’s Rosetta mission is on a 10-year mission to explore comet 67P/Churyumov-Gerasimenko. The spacecraft will orbit the comet and study it as it approaches the sun and deploy a lander to make the first landing on a comet. The Kuiper Belt is a disc-shaped region of icy objects beyond the orbit of Neptune — billions of kilometers from our sun. 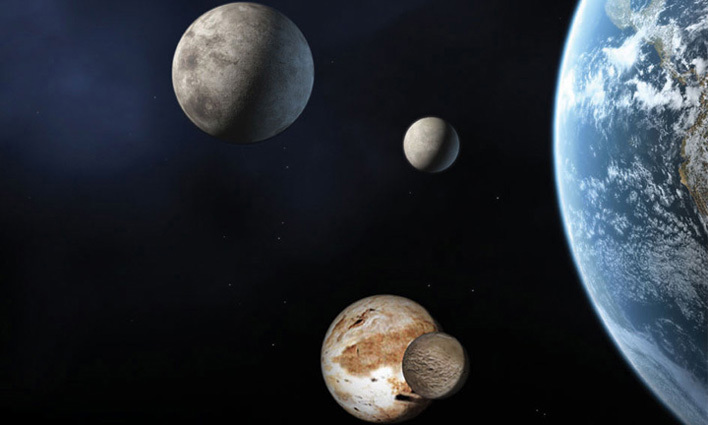 Pluto and Eris are the best known of these icy worlds. There may be hundreds more of these ice dwarfs out there. The Kuiper Belt and even more distant Oort Cloud are believed to be the home of comets that orbit our sun. In 1950, Dutch astronomer Jan Oort proposed that certain comets come from a vast, extremely distant, spherical shell of icy bodies surrounding the solar system. This giant swarm of objects is now named the Oort Cloud, occupying space at a distance between 5,000 and 100,000 astronomical units. (One astronomical unit, or AU, is the mean distance of Earth from the sun: about 150 million km or 93 million miles.) The outer extent of the Oort Cloud is believed to be in the region of space where the sun’s gravitational influence is weaker than the influence of nearby stars. The Oort Cloud probably contains 0.1 to 2 trillion icy bodies in solar orbit. Occasionally, giant molecular clouds, stars passing nearby, or tidal interactions with the Milky Way’s disc disturb the orbits of some of these bodies in the outer region of the Oort Cloud, causing the object to fall into the inner solar system as a so-called long-period comet. These comets have very large, eccentric orbits and take thousands of years to circle the sun. In recorded history, they are observed in the inner solar system only once. In contrast, short-period comets take less than 200 years to orbit the sun and they travel approximately in the plane in which most of the planets orbit. They are presumed to come from a disc-shaped region beyond Neptune called the Kuiper Belt, named for astronomer Gerard Kuiper. (It is sometimes called the Edgeworth-Kuiper Belt, recognizing the independent and earlier discussion by Kenneth Edgeworth.) The objects in the Oort Cloud and in the Kuiper Belt are presumed to be remnants from the formation of the solar system about 4.6 billion years ago. The Kuiper Belt extends from about 30 to 55 AU and is probably populated with hundreds of thousands of icy bodies larger than 100 km (62 miles) across and an estimated trillion or more comets. NASA’s New Horizons will be the first spacecraft to visit Pluto and the Kuiper Belt. The spacecraft’s journey began in January 2006. It will continue into the Kuiper Belt after its Pluto flyby in 2015. “Eyes on the Solar System” is NASA’s 3-D environment full of real NASA mission data. Explore the cosmos from your computer. Hop on an asteroid. Fly with NASA’s Voyager spacecraft. See the entire solar system moving in real time. It’s up to you. You control space and time. Already taken a tour? Jump in and start exploring the Solar System on your own. Keep checking back for new features, tours and news. Just like the universe, “Eyes on the Solar System” is expanding. Watch the intro to get started and the video tutorials to become an expert. The outer, gaseous planets are much less dense than the inner, rocky planets. The Earth is the densest planet. Saturn is the least dense planet; it would float on water. The planet with the strongest gravitational attraction at its surface is Jupiter. Although Saturn, Uranus, and Neptune are also very massive planets, their gravitational forces are about the same as Earth. This is because the gravitational force a planet exerts upon an object at the planet’s surface is proportional to its mass and to the inverse of the planet’s radius squared. As the planets orbit the Sun, they travel at different speeds. Each planet speeds up when it is nearer the Sun and travels more slowly when it is far from the Sun (this is Kepler’s Second Law of Planetary Motion). The planets in order of increasing semi major axis are Mercury, Venus, Earth, Mars, Jupiter, Saturn, Uranus, and Neptune. Although the IAU recently removed Pluto form the list of planets, it is included with the planets on most of our web-pages. Plots showing the inner region of the solar system (just beyond Jupiter) and outer solar system region (just beyond Pluto) are available. Selected physical parameters such as mass, bulk density, mean radius, and geometric albedo are available for the planets. These parameters are presented in a table with references. Planetary ephemerides are available using JPL’s HORIZONS system. Although the HORIZONS system will be sufficient for the vast majority of ephemeris requests, JPL planetary and lunar ephemeris files (e.g. DE406) are also available. The use of these ephemeris files is recommended only for professionals whose needs are not readily met by the HORIZONS system. Alternatively, you may use the NAIF SPICE toolkit and planetary ephemerides in SPK format from JPL’s NAIF web-site. Approximate positions of the major planets and Pluto may be found by using Keplerian formulae with their associated elements and rates. Such elements are not intended to represent any sort of mean; they are simply the result of being adjusted for a best fit. As such, it must be noted that the elements are not valid outside the given time-interval over which they were fit. Such orbital elements should not be used to compute high accuracy ephemerides. See the Ephemerides section (above) for information on what is available for planets. Please consult their page detailing the approximation of planetary positions using Keplerian elements for more information. Gravity field data used in our planetary satellite orbit determination models for the outer planets (Jupiter, Saturn, Uranus, and Neptune) is given in a table with references. Radar astrometry for some of the planets is available from this site. Scroll down the page until you find the heading “Radar Ranging”. 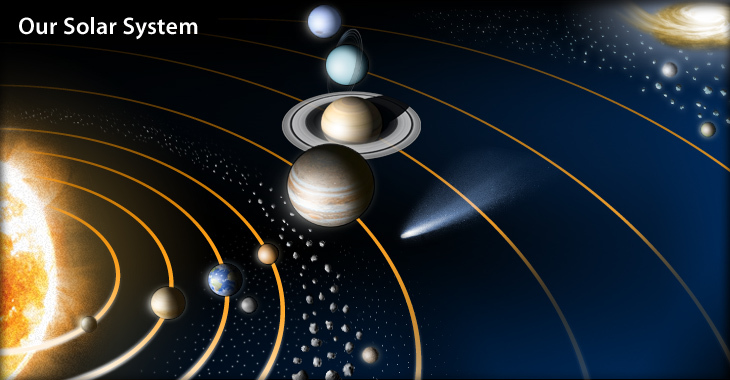 Visit the JPL Solar System page for more information about the planets.